Making Instant Pot eggs is incredibly quick and easy! I have some simple tips and a cooking time chart to help you. We’ll cover how to make eggs in an Instant Pot in almost any style! 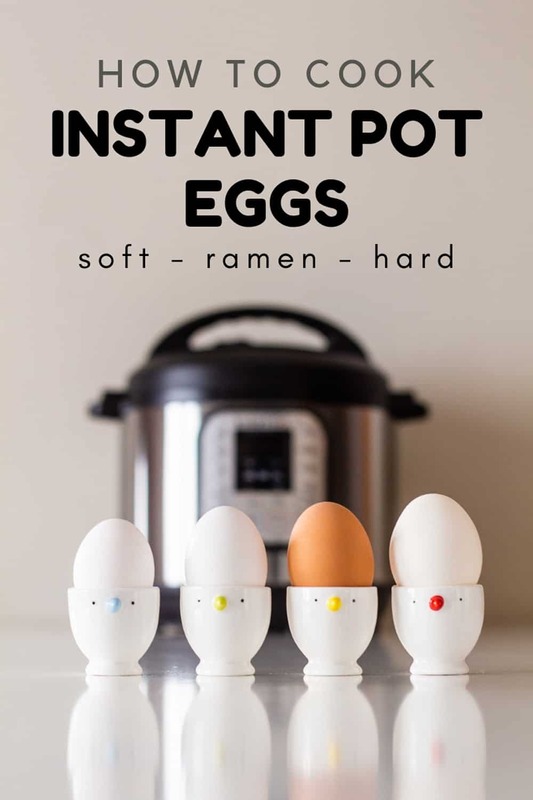 From the perfect pressure cooker runny eggs and ramen eggs to Instant Pot hard-boiled eggs, too! 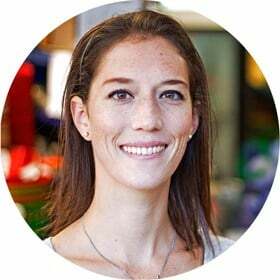 What Instant Pot accessories do I need? 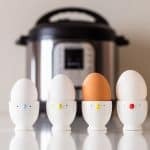 Before we jump into the cooking methods for Instant Pot eggs, let’s cover some Instant Pot accessories. While these aren’t crucial to cooking eggs perfectly, they’ll make things easier for you. Also, these tools will help prevent the eggs from cracking during the cooking process. All of the current Instant Pot models come with a metal Instant Pot trivet. The trivet’s job is to hold foods above the cooking liquid. There are trivets with and without lifting handles. When you make Instant Pot eggs, using a trivet with handles is ideal. In addition to metal trivets, there are also silicone trivets. While it’s not critical to the success of pressure cooking eggs, using an egg rack is so helpful! This is the Egg rack (affiliate link) that I use. To use an egg rack, you simply place the eggs on top of the holes. Egg racks come in single, double, and even triple-stacked versions. One critical tool for the success of cooking eggs is an ice bath. Not to be confused with a sports therapy ice bath, an ice water bath stops the eggs from overcooking. If you don’t do this, your eggs will continue to cook as they cool down. To make an ice bath place ice cubes into a large mixing bowl. Add enough ice for the bowl to be 2/3rds full. Then, add cold water to the bowl, about halfway up the height of the ice; just enough that the ice cubes begin to float. To make things as easy for you as possible, the methods shown are based on the size of the eggs. 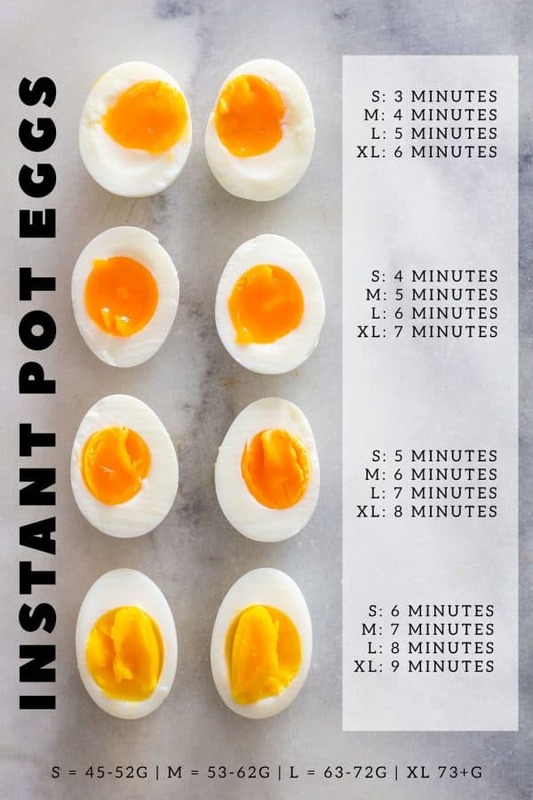 This way, you can be sure that your Instant Pot eggs will cook perfectly! 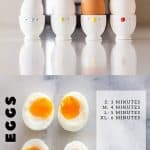 It doesn’t matter whether you cook your eggs in a 6-quart Instant Pot or another size; cooking times will be the same. If you have a 6-quart Instant Pot, place 1 cup of water into the bottom of the pot. For an 8-quart Instant Pot, you will need to add 2 cups of water. Place the eggs into an egg rack or stack them onto a trivet. Close the lid, set the valve to sealing position, and manually set to high pressure. I don’t recommend leaving Instant Pot eggs in an ice bath for longer than 60 seconds. After one minute, the cooking process is stopped completely, but the eggs will still be warm. All that extra minutes in an ice bath will do is make your eggs cold. When the cooking time ends, performing an immediate quick pressure release is super important. Turn the valve to the venting position; open the pot as soon as the safety pin drops (usually after 1 minute). Cook for 3 minutes at high pressure. Perform a quick release of pressure. Transfer the eggs to an ice bath for 60 seconds. Peel, then cut it open. Cook for 4 minutes on high pressure, followed by a quick release of pressure. Transfer the eggs to an ice bath for 60 seconds. Peel, then cut it open. Cook for 5 minutes at high pressure, followed by a quick pressure release. Transfer the eggs to an ice bath for 60 seconds. Peel, then cut it open. Cook for 5 minutes at high pressure, followed by a quick release of pressure. Transfer the eggs to an ice bath for 60 seconds. Peel, then cut it open. For the remaining cooking styles, follow the same process as shown above. The only differences are the cooking times. Regardless of the type of Instant Pot eggs you make, always use high pressure. When eggs are hard-boiled, the color will be light yellow, not orange anymore. Egg peel weight can vary from 1-7 grams. The thicker and heavier the eggshell, the faster the egg cooks, because there is less egg in the shell. There can be a difference in cooking time up to 1 minute. A 60-gram egg with 1 gram eggshell needs 4 minutes to be soft boiled but only 3 minutes if its shell is 7 grams. There is no way to tell by looking at the egg how heavy the shell will be. Here are some important factors that influence eggshell thickness. Also, I spoke with a backyard hen owner. She says that eggshell thickness depends on what the hens choose to eat. This even applies to hens that are kept in exactly the same environment, offered the same food, and are of approximately the same age. That being said, I have fairly consistent results when I buy the same brand of eggs every time. Shell thickness doesn’t seem to vary as much when I stick with one brand. Making Instant Pot eggs is incredibly quick and easy! I have some simple tips and a cooking time chart to help you. We'll cover how to make eggs in an Instant Pot in almost any style! From the perfect pressure cooker runny eggs and ramen eggs to Instant Pot hard-boiled eggs, too! Preferably weigh eggs with a digital scale to 100% ensure correct cooking time. If you don't have a scale don't worry. It'll most likely still work with the S, M, L, XL size indication. Prepare an ice bath to have on hand. Add 1 cup of water to 6-quart Instant Pot or 2 cups of water to 8-quart Instant Pot. Place Trivet or egg rack in instant pot and place egg(s) on top. Put on the lid, secure it, and turn the valve to the sealing position. Set Instant Pot to high pressure for the minutes indicated on the image above in the blog post. Anywhere from 3-9 minutes depending on the size of the egg and cookedness desired. Once the Instant Pot beeps, immediately quick release pressure by turning the valve to the venting position. Once the safety pin drops (usually within a minute of initially opening the valve), remove the lid and put the egg(s) in an ice bath for 1 minute. Remove egg(s) from ice bath and peel. Greetings. Would the XL egg times work for jumbo eggs? In this post XL and Jumbo are used synonymously. I added the weight range at the bottom of the image chart however because different countries and brands might have different rules as to what “sizing” is considered for different eggs.